At FEZZIWIG'S WAREHOUSE the ebullient Mr. Fezziwig, young Scrooge's employer, invites you to his holiday party - do join the Dance! Bangers & Mash provide lively ballroom and English country dance music, with reels, jigs, polkas and waltzes. You might even see young Ebenezer Scrooge dancing with his sweetheart, and shocking entanglements ensue with The Trial of Samuel Pickwick. 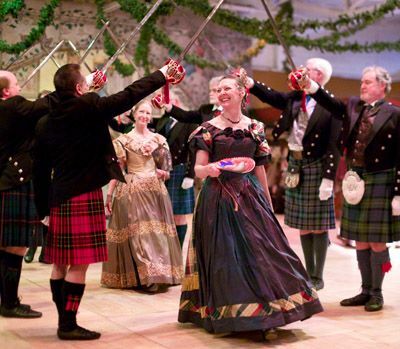 The Siamsa Scottish & Irish Dancers join the fun with lilting Highland tunes and stirring steps. When the musicians pause for a well-earned rest, visitors can join in a lively round of “Wink,” “Stagecoach,” or other Victorian parlour games. The grand VICTORIA & ALBERT BIJOU MUSIC HALL provides visitors a wealth of entertainments from which to choose. Back by popular demand, the Music Hall Singers present a mischievous, musical introduction to Trial By Jury ~ a new comic opera from the brilliant, young satiric composers Gilbert and Sullivan. Especially for children (of all ages), the Stark Ravens Players present a proper British Holiday pantomime, The Surprising Tale of Baron Munchausen and Mopsa the Fairy: or how Munchausen, Jack and Mopsa defeat evil Queen Edwina Picklewurst and save Fairyland. 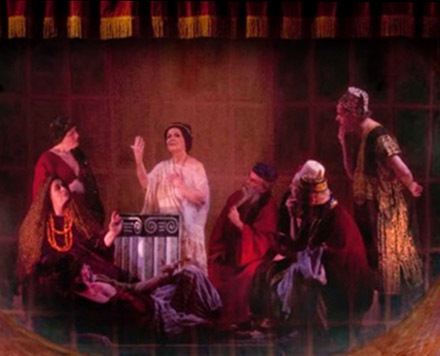 Her Majesty’s Royal Opera Gala presents two shows, the first in light operetta style and the second of grand opera classics. Star actors of the English stage gather to rehearse All’s Well That Ends Badly and hilarity ensues as the show reveals how they really feel about each other. The scene changes at 5:30 to ‘Dickens After Dark’, when grown-ups will appreciate the more adult fare of the artistic, yet provocative Saucy French Postcards Tableaux Revue (18 and over only, please; free tickets available at the Telegraph Booth on a first-come, first-served basis - get yours early in the day!). In the GREEN MAN INN in Pickwick Place, London locals including the Pickwick Club can be found quaffing fine brews and holding forth with harmonious songs of the day. The illustrious Mr. Charles Dickens reads captivating passages from his books at posted times and even Her Majesty, Queen Victoria, stops by for tea. At the FATHER CHRISTMAS STAGE sweet caroling rings out and Father Christmas himself magically appears beside a great toy-bedecked tree, jovially inviting young lads and lasses to join him for a holiday photo memento! Enjoy a British take on American melodrama with the perennial favorite Jack is Back! followed by the arrival of the Toy Parade. Lewis Carroll's stories come to fantastical life with the Mad Hatter's Tea Party and frabjous tales from the characters of Wonderland Story Time. Family fare continues as children are chosen to participate in the Stark Ravens' Bold Tailor, and Rats in the Haggis stop by to musically enchant one and all. Just across the way in Brick Lane, you'll find the TRAVELING PICCOLO PUPPET PLAYERS, where children will delight at the illuminating antics of Mr. Punch and his mischievous friends. Beyond Grenadier's Gate lie The London Docks, Thameside home to the PADDY WEST SCHOOL OF SEAMANSHIP and other nautical riffraff as well as the Congress of Wonders & Atrocities - possibly the worst sideshow in all of London. Look out for carousing sailors! Buy them some rum and they'll sing you a song. Be sure to pay a visit to the London Constabulary at the Gaol, and look sharp that you don't "get your collar felt" (locked up)! Our own Coventry Carolers pay a melodious call as they bring holiday cheer to all parts of London ~ even the scurrilous denizens of Fagin’s Den. Around the corner from the Paddy West Stage, you can visit FLOCKMOCKER'S WORKSHOP, where Prof. Phineas J. Flockmocker III will confound you with his curious inventions, dubious facts, and total disregard for conventional science. You might even see Steam Man! Over on Petticoat Lane stands THE ADVENTURERS CLUB where one can hear exciting tales of military and scientific exploits, as well as literary and artistic achievement. The Club's walls are replete with mementos of British exploration; famous figures of the time also congregate to discuss and demonstrate science, literature and the arts. The Pre-Raphaelite Brotherhood offers an artist salon where guests may sketch live models alongside famous artists and writers like Dante Gabriel Rossetti, Oscar Wilde, Edgar Allan Poe, and John William Waterhouse. For more details on each presentation, and special happenings offered each day, please see the Adventurers Club Open House Schedule and find a complete list of the Adventurers Club members at their Member Roster. Continuing along to Cratchit's Yard you'll find the PENNYGAFF STAGE, where you may behold thrilling jugglery, riotous antics, and other merry matters of supreme importance with the Trickish Matters of Jeremiah Johnston. Marvel at the buffoonery of London's most hilariously silly chimney sweep in The Perniculous Adventures of Jim Chiminey, and be astonished at the world premiere of Dr. Xander T. Culpepper’s Miracle Elixir Show Of Miracles! Throughout the day, watch scenes from Dickens’ A Christmas Carol come to life both on the Pennygaff stage and in the streets of London. Behold the Ghost of Jacob Marley and the ghosts of Christmas Past, Present and Yet-to-Come, along with the long-suffering Bob Cratchit and his family, as they help the old miser Ebenezer Scrooge learn the true spirit of the season! And be sure not to miss the introduction of the Christmas Tree by His Royal Highness Prince Albert to Her Royal Majesty Queen Victoria and the celebratory Christmas at Dingley Dell with the members of the Pickwick Club. Just next door you'll find Prince Albert's GREAT EXHIBITION STAGE, where you can view a model of the Crystal Palace, and interact with innovative thinkers of the day including scientists, paleontologists, industrialists, inventors, engineers & artists. Demonstrations & participatory experiences occur throughout the day. Young artists and scientists are encouraged to attend! Over on Nickelby Road you might pay a call at the THE DICKENS FAMILY PARLOUR and visit with his family, characters from his novels, visiting performers, and enjoy frequent visits from the illustrious author himself. 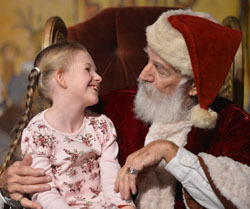 Partake of festive parlour games, Christmas carols and sing-a-longs, and observe a working Victorian kitchen. Even Mr. Scrooge comes by to pay his respects during the holiday season! Just across the street, music and dance from around the world grace the SILK ROAD STAGE, where you might hear caroling one moment, and see lively Irish, Middle Eastern, or Morris dancing the next. 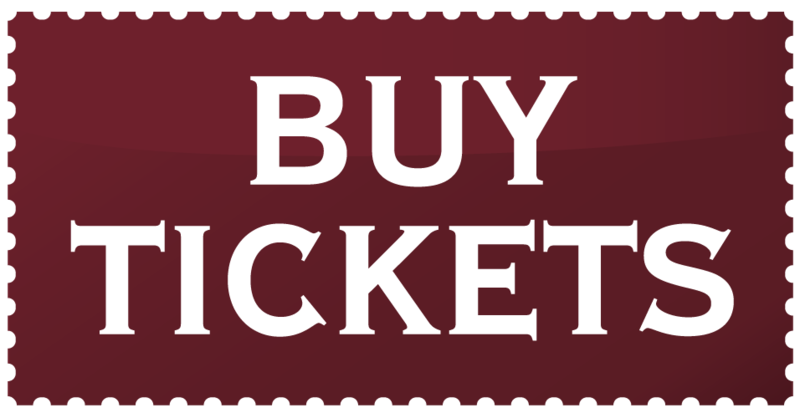 Enjoy a traditional mummers play with Mr. Brown's Mummers, join in English country dance with The Crown & Anchor Dancers, or traditional Irish Dancing with the Silk Road Ceilidh. 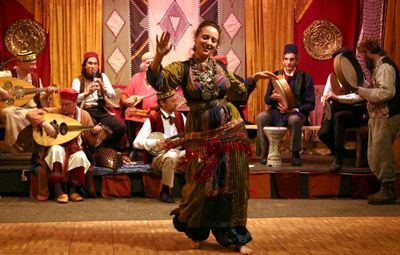 Waltz and polka to the infectious rhythyms of The Bruno Band and enjoy exotic Middle Eastern Dance on certain days. Down by the Thames, sounds of raucous merriment draw the venturesome soul to MAD SAL'S DOCKSIDE ALE HOUSE, where Pipe & Bowl Morris perform lusty traditional dances celebrating beer, flirting, and the pleasures of country life. The gentlemen of Brass Farthing lift a frothy good ale with their rollicking songs and the ladies of The Gin Alley Sallys musically include you in their Society for the Appreciation of Libation and Spirits. 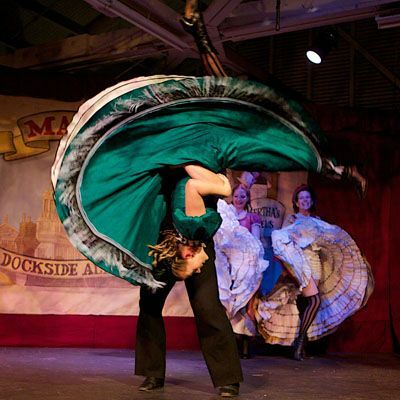 And don't miss Mad Sal’s Dockside Music Hall, hosted by Mad Sal herself, and including our brassy bevy of high-kicking beauties from across the Channel, the wicked Le Cancan Bijou. At the end of the day, they invite you to join them at The East End After Hours 'oliday Hextravaganza! CHARACTERS IN THE STREETS: A multitude of characters come to life from the pages of Mr. Dickens' novels - Bob Cratchit and Tiny Tim, David Copperfield, Nicholas Nickelby and his family, Oliver Twist and Nancy, mingling with colorful street characters of the period - roving chimney sweeps, musicians, carolers, music hall performers, and saucy sailors. See Robert Peel's new "Peelers" as they patrol the streets of London keeping the citizens of London safe from the likes of Bill Sykes and Fagin's little pickpockets. 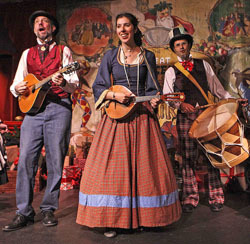 There are over 800 costumed players to entertain you at the Great Dickens Christmas Fair!